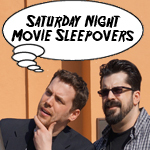 Please pay a visit to our latest Podwits venture, Saturday Night Movie Sleepovers! Dion Baia and J. Blake of the Podwits fame highlight films from their youth that would have typically been rented for a weekend sleepover by you and your friends. A new movie may be thrown into the mix to spice it up, but cult classics and forgotten gems will surely be featured on this podcast. So dig out those old video store membership cards, your Jiffy Pop®, and your jumbo 24-ounce bottle of cola, and prepare yourself for the ever-exciting, entertaining and informative Saturday Night Movie Sleepovers!! !